I heard a story recently, of a blind man carrying a lantern. Kind of strange, isn’t it? Why would a blind man need a lantern? It wouldn’t matter to him even if it’s pitch dark, for he is intimate with a darkness that nobody else knows. A brave stranger couldn’t withhold his curiosity and asked the poor man, who was the laughingstock of the town, why did he need a lantern. He answered, the light isn’t for him. He doesn’t need it. The light is for others, who may not be able to see him in the dark, and may bump into him by accident in the dark. I think this is an apt analogy of what John 1:5 is about. The light shines in the darkness, and the darkness has not overcome it. And subsequently, I think John 1:5 is a perfect statement of what the Christian life is about. Light is a commonly used concept in the Bible. 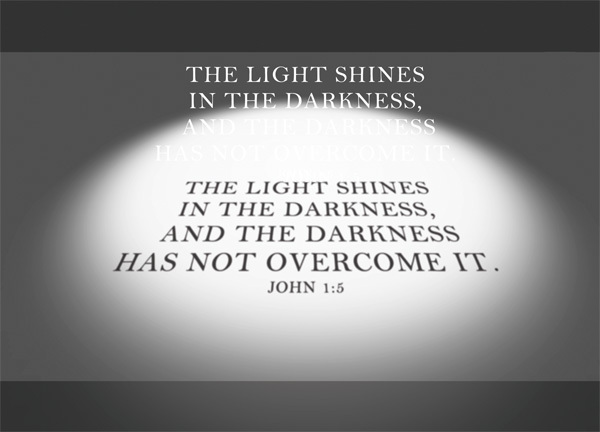 By using this verse as a fulcrum, this will be a study on the light and the darkness in the Bible, referring especially to John’s many verses on the concept of light. The light shines in the darkness – Firstly let us address what is the light and what is the darkness. Light is God, it is Christ [John 8:12], it is the way to God, it is the gospel. Darkness is sin, is evil, is disbelief – Light has come into the world, but people loved darkness instead of light because their deeds were evil [John 3:19]. The apostle John gave us a clear idea in 1 John 1:5-7 – God is light; in him there is no darkness at all. If we claim to have fellowship with him and yet walk in the darkness, we lie and do not live out the truth. But if we walk in the light, as he is in the light, we have fellowship with one another, and the blood of Jesus, his Son, purifies us from all sin. From this passage, we are told clearly that God is light; and the darkness that envelopes us is the world of sin. If we treat this as algebra; basically; what John is saying is God shines even in this world of sin. If we look at this phrase carefully, we ought to be grieving, for it is testament to the state that mankind/the world has fallen to: darkness. We are in a state of darkness; we live in sin, we live amongst evil, we live with disbelief. Yet in every bleak scenario we as Christians always can find hope. Despite being in darkness, light still remains; light still shines. This light is our hope, is our pathway to salvation; the only way to leave the darkness, is to walk towards the light. the darkness has not overcome it – We see a conflict between light and darkness here – darkness tries – but fails – to overcome the light. Why? How? John 1:1-4 tells us in advance. This light is the living light and the light of life [John 1:4]. I am the light of the world. Whoever follows me will never walk in darkness, but will have the light of life [John 8:12]. This light belongs to the life of the One through whom all things were made [John 1:3]. While I am in the world, I am the light of the world [John 9:5]. Lastly, this light, this life, this Word – is God [John 1:1]. Your word is a lamp for my feet, a light on my path. [Psalm 119:105|Article]. Darkness has no claim on Light, because this light is the light that is the light of life; it is the light of the Creator of the World, it is the light of the true Word, which was already there in the beginning. This light is God, and nothing has any claim over God. Darkness can never overcome God. This light will always shine through the darkness. For you were once darkness, but now you are light in the Lord. Live as children of light [Eph 5:8]. When one day you look around you and you see nothing but darkness and you do not know what to do, remember that God is here. The light shines in the darkness, and the darkness cannot overcome it. Turn back to God. Go to the light. Come to the light. Remember what Jesus said: I have come into the world as a light, so that no one who believes in me should stay in darkness [John 12:46].